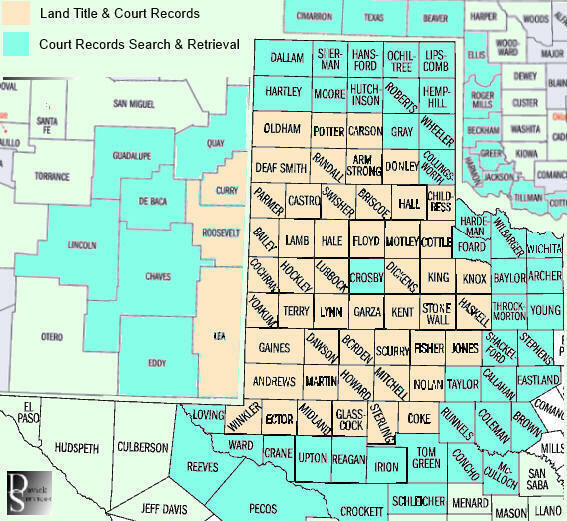 Based in Lubbock County Texas, Davick Services provides fast, accurate and reliable abstracting and court records research into 117 rural counties in Texas, New Mexico, Oklahoma and Kansas. Rest assured all searches are completed at the courthouse and covered by our $1,000,000 E&O insurance policy. Andrews, Archer, Armstrong, Bailey, Baylor, Borden, Briscoe, Brown, Callahan, Carson, Castro, Childress, Clay, Cochran, Coke, Coleman, Collingsworth, Concho, Cottle, Crane, Crockett, Crosby, Dallam, Dawson, Deaf Smith, Dickens, Donley, Eastland, Ector, Fisher, Floyd, Foard, Gaines, Garza, Glasscock, Gray, Hale, Hall, Hansford, Hardeman, Hartley, Haskell, Hemphill, Hockley, Howard, Hutchinson, Irion, Jack, Jones, Kent, King, Knox, Lamb, Lipscomb, Loving, Lubbock, Lynn, Martin, Midland, Mitchell, Moore, Motley, Nolan, Ochiltree, Oldham, Parmer, Pecos, Potter, Randall, Reagan, Reeves, Roberts, Runnels, Schleicher, Scurry, Shackelford, Sherman, Stephens, Sterling, Stonewall, Swisher, Taylor, Terry, Throckmorton, Tom Green, Upton, Ward, Wheeler, Wichita, Wilbarger, Winkler, Yoakum, and Young counties. Chaves, Curry, De Baca, Eddy, Guadalupe, Lea, Lincoln, Quay, Roosevelt, and Union counties. Beaver, Beckham, Cimarron, Cotton, Ellis, Greer, Harmon, Jackson, Jefferson, Roger Mills, Texas, and Tillman counties. Morton, Seward and Stevens counties.